Energy use in the industrial sector is dominated by the use of heat from fossil fuels. A low carbon economy requires transition to more sustainable sources. This can be done by heat production from renewable sources or by recycling of waste heat. Both options need heat pumps as enabling technology. The STEPS project aims to develop and implement heat pump technology that produces steam in the temperature interval 120-200°C in a way that is economically feasible and uses geothermal or industrial waste heat as source. This technology can be applied in (petro)chemical industry, refining, paper & food industry. 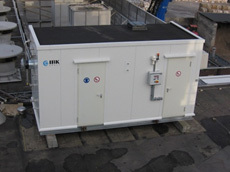 The project is coordinated by ECN and carried out in a large industrial consortium consisting of end-users AkzoNobel, Bavaria, Dow, DSM, Heineken, Huntsman, LambWeston Meijer and Warmtebedrijf Rotterdam, technology suppliers Bronswerk Heat Transfer and IBK, and engineering & consultancy company IF technology. Most industrial processes that require heat at temperature levels up to around 200°C require steam at different pressure/temperature levels. The temperature of industrial waste heat is by definition too low to be reused directly. Another abundant source of heat is geothermal energy, which is available at temperatures between 90°C and 200°C depending on the location and depth of the well. However, when heat is withdrawn, the temperature will drop (‘temperature glide’) below the required steam level. This means that without any additional measures, only a limited portion of the geothermal energy can be utilized directly. The gap that exists between the temperature level and glide of geothermal heat or waste heat and process heat can be bridged with the aid of heat pump technology. The STEPS project will develop and test two advanced heat pumps concepts for this application, being a multistage reverse Rankine system and a single stage thermoacoustic system. Both systems fit well within the conditions given by either geothermal or waste heat source and the required process heat sink. The measurement data is used to assess techno-economic feasibility by evaluating individual business cases. The STEPS project started recently and will run for 2,5 years. The project is partially subsidized by the industrial energy savings program of the Topsector Energy. The Netherlands Enterprise Agency (RVO.nl) is executing this program for the Institute for Sustainable Process Technology (TKI-ISPT).